Posted by hslu in Health Insurance, Taiwan. I’ve heard that many people who live in the United States have returned their residences to Taiwan because they will be eligible for Taiwan’s public health care when they retire in a few years. I’ve objected Democrats’ push for a public option on health insurance reform. I contended that it will be the beginning of the end of US’s dominant positions on drug and medical instrument innovations. It will also seriously decrease the level of medical services for every citizen in the U. S, starting with the senior citizens of which I am rapidly becoming one. Not to mention the red tapes, rationing, and higher costs! I am sure you’ll tell me that there are many great examples of successful public medical services in countries such as Canada, Great Britain and Taiwan. Mrs. Chen goes up at 3 AM and rode her bike to Gao1 Xiong2’s Zhang1 Gen1 Hospital to be inline for a spot to register for an appointment with a doctor today. She was beaten by another person who was there first. She didn’t get an appointment yesterday because he got up too late. A nurse who has breast cancer tried many times at another hospital but couldn’t get an appointment. She asked her relatives to help her. With five PC’s trying all day, she finally gets the no. 1 spot after midnight, 55 days later. A female single parent who has cancer couldn’t go to the hospital until after 7 AM because she has to send her child to school in the morning. After three months without a single appointment, she cried for help at hospital’s Public Relation Office but the hospital couldn’t help her at all. Me. Lee’s cancer has been in remission for 6 years. Unfortunately it returned three months ago. Every night, he takes 6 PM train for the 40-minute trip to Gao1 Xiong2 from his hometown in Ping2 Dong1. With a small wooden bench he kept at his relative’s home in Gao1 Xiong2, he began his nightly wait at Gao1 Xioang2 University Medical Center from 10:30 PM until the registration office opens in the morning: 7 AM. He usually gets number 50 or 60 which means he won’t see the doctor until after 12 noon. Hmm, 3 (maybe 4) hours, 50 patients, we are talking about three or four minutes per patient. Efficient! Mrs. Xiao1 comes at 5 AM today. She is inline for her husband who has heart trouble. She is the 10th in line. She didn’t get an appointment yesterday because she got up too late. Online and telephone registrations are available for most if not all hospitals. They are very convenient for making an appointment with your favorite doctor if you don’t mind seeing him or her next month or 60 days later. If you want to see him today, you have to come early and get in line. By the way, VIP out patient service is available if you are willing to cough out 1,500 NT each time. That’s about $50. Health insurance premium is about to go up soon because the system is out of money now. Will you be inline when you are 78 years old with heart trouble? Do you have someone else to sit in line for you? Would you like to wait for 9 months for an MRI scan? Make sure you have your government-issued health insurance card with you ALL the time. A guy in Canada didn’t have it when he went to the emergency room with stomach ache. The staff asked him to get his card before the treatment. He didn’t make it back to the hospital. Posted by hslu in Economics, Politics. To reduce unemployment, the president promised companies a tax credit of up to $5,000 for each new hire. Hmm, I can’t hire anyone, $5,000 tax credit or not, if customers do not coming in to my restaurant. 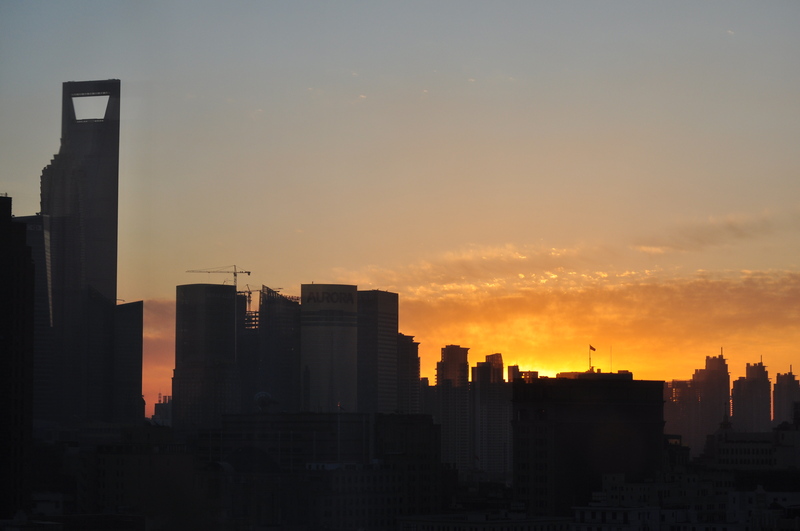 The economy grew at an annualized rate of 5.7% in the 4th quarter of 2009; reads the online version of the the New York Times headline. Not according to my sales numbers! Greece’s national deficit is 12.7% of its GDP. The government has been rumored of facing default of its debt and there are talks of possible bailout from its European neighbors. Walls Street took note and dropped 1.1% yesterday. Greece adopted Euro in 2001 and European Union requires its member to hold its deficits below 3% of its GDP. If Greece defaults, there may be serious consequences and other countries in Europe such as Spain, Italy and Portugal may face the same fate. The trend of mandatory spending is sure to go up as a percent of US GDP. 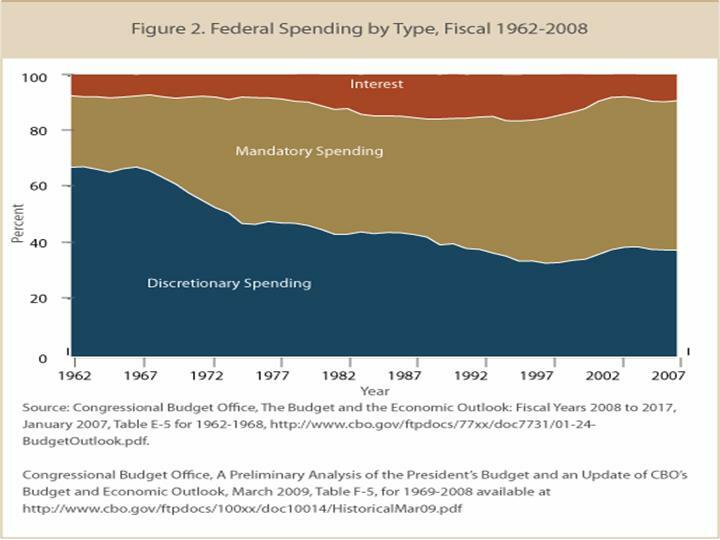 As interest payment increases, discretionary spending will have to come down. I can’t image what this graph will look like in 3 years if inflation comes back with a vengeance. Posted by hslu in 5584. PDVSA, the national oil company of Venezuela, just signed a contract with Eni, an Italian oil company partly owned by Italian government. The contact, signed in the presence of Chávez, allows Eni to work with PDVSA to develop a heavy oil block in the Orinoco Belt heavy oil field. Sorry, ExxonMobil, ChevronTexaco and ConocoPhillips. The America companies are not allowed. The estimated heavy oil resource in the Orinoco Belt is 1.3 trillion barrels; the largest heavy oil filed in the world. With new and current technology, Venezuela has more recoverable oil than what Saudi Arabia has. Heavy oil is less valuable than Saudi light. No doubt about it. But, after most of the light oil is gone, whom do you (America) ask for more gas? Ghostbusters? Posted by hslu in Economics, Global Affair, Politics. While more Americans are still losing jobs left and right, you can gt a job with Uncle Sam if and only if you live in Afghanistan and work for Taliban. You job is to kill as many Americans as you can by whatever means at your disposal. If you take the money and job, you are not supposed to continue your previous job though. You may have to sign a contract and promise not to moonlighting as a Taliban fighter after work. Yeah, no problem. You don’t have to worry about the deficits. To hell with the debt. We can’t pay it off anyway. The U.S. will print more green backs and send it over to Karzai. He’ll give the money away. Make sure that you are a Taliban fighter with ID and necessary paper to proof your identity. We may need your commander’s letter of recommendation if we doubt your true identity. The higher your rank in Taliban, the more money you can get. If you are high enough, you may become a manager. Heck, if you are the leader of a pack, we may give you a job at the U.S. federal government and a house in Georgetown. By the way, before I forget, you’ll keep your job until retirement. And don;t forget the retirement benefits and free health care. We are still studying whether to give your wives, kids, parents, relatives free health care for their lives at this time pending approval from BHO. Here we go again, The United States is messing around other country’s politics. Will Karzai stay in power for the next five years? He better gets capable body guards if he wants to live that long. hang in there, Karzai, 30,000 more US troops are coming. We’ll spend up to $1 billion per soldier every year. Your economy will get a boost soon. Posted by hslu in China, Chinese, Life, Death and Yuanfen, Shanghai. Today we said goodbye to Shanghai. I got up early and found out it was such a beautiful day: no smog, partly cloudy sky and gorgeous sun rise made me wanted to stay another day or two. Well, it was time to go and Taipei was waiting for us. Let’s move quickly because I had to pack first and get Xiaobao out of his bed soon. We have almost an hour’s taxi ride to Shanghai’s Pudong Airport. 上海灘 is the theme song of a Cantonese TV drama series and movies of the same name. It first aired in Hong Kong in March, 1980. The story took place in Shanghai in 1930 a few years before the war broke out with Japan. At that time, Shanghai was a glamorous city with money, beautiful women, foreign goods, power, gangsters and drugs. The lead character, 許文強, played by Chow Yun-Fat 周潤發 “zhou1 ren4 fa1,” was a college student who came to Shanghai. He soon became a gangster working for the mob boss, Mr. Feng, the most powerful man in Shanghai. His love story with several beautiful girls, including Mr. Feng’s daughter, also made this movie memorable. His struggle for power and fight for survival illustrated the dangerous life as a member of the triad. After Mr. Feng helped him became a powerful man in Shanghai, he turned against Mr. Feng because he found out Feng was helping Japanese smuggling drugs into China. For that, the Japanese sent an assassin to kill him. However he was saved by his first love from his home town, Mr. Feng’s mistress, who took a bullet for him. Later about the time when he was about to marry Feng’s daughter, more assassins were sent to kill him. After Feng’s daughter chose to leave him for his own protection, he left Shanghai and fled to Hong Kong where he married another girl and started a new life. Eventually, Feng found this out and sent assassins to kill him and his family. His family died and he escaped. He then returned to Shanghai to seek revenge. This TV drama series propelled 周潤發 into the lime light and made the theme song 上海灘 one of the most popular songs in Hong Kong. I do not know how to sing it in Cantonese but I like it very much especially the version by 葉麗儀 “ye4 li4 yi2”, Frances Yip. Her voice was powerful; her lyrics were clear and her pronunciation concise. She sings with feeling and heart. The song also made Shanghai’s thrilling life in the 1930’s very fascinating. This version by葉麗儀 was accompanied by a Chinese instrument orchestra. However, it doesn’t have the mandarin lyric. Try the following to get the Mandarin lyric. Check the following link to get more info and the Cantonese version of the lyric. No matter how unwilling I was, I had to leave this city for now. I remember the first time I came here in 1986, the Shanghai I saw from the airplane was dark. There was no red, green or yellow color in the city because it was dull and shabby with nothing but grey, blue and black. In any government-run businesses, I had to wait to get any service at all. There were few smiles on people’s face and we got charged 4, 5 or even 10 times of what ordinary Shanghainese would pay. There were thousands of bicycles and very few cars. Capitalism was still in its infancy and I barely saw a few businesses under big warehouse like markets. To buy food from a restaurant, I had to use rice stamps and cooking oil stamps in addition to RMB. As I looked around the city, the sky line was filled with old houses and small buildings. 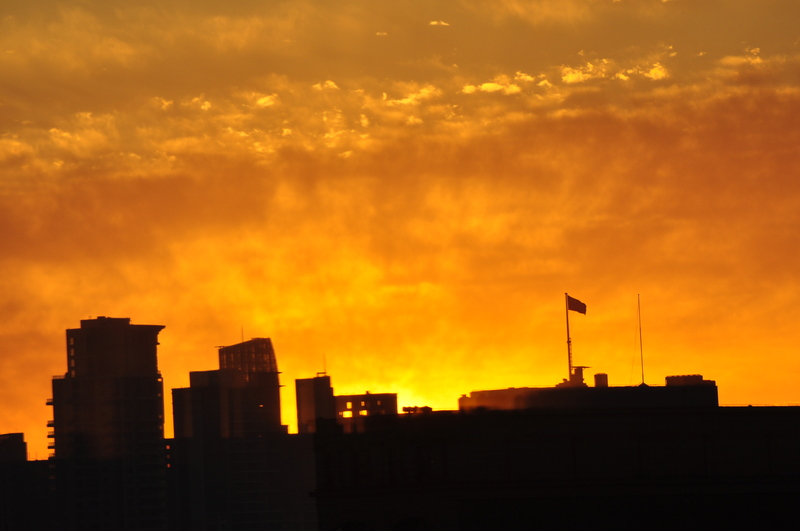 There were very few tall buildings and most of them concentrated along the Huangpu River and The Bund. Pudong was not developed and the ride into the city from Pudong Airport was bumpy and time consuming. As I ate my first meal in a restaurant at Shanghai’s城隍廟, several people stood next to my table in order to get my seat after I finished my meal. Many things I saw for the first time and places I went for the first time, I read them in history books or saw them in movies when I was a kid in Taiwan. That experience had such an impact to me, I could never forget. Since then, I went back to Shanghai a few times and the city has certainly regained its previous glory. The Bund was as glamorous as before. 新天地, 淮海路, 陸家嘴 and 金茂大厦 are the pinnacle of recent developments in this city. Subways, wide streets, elevated highways, high-rise apartment buildings and glitter commercial buildings are every where. Cars, cars and everywhere you go, there were cars. Everything is so much different and I couldn’t see any sign of the shoddy city I saw in 1986. How things changed so fast and so dramatic, proving again the Chinese saying we know so well: 三十年河東三十年河西. Posted by hslu in Politics, Taiwan. Isn’t there a law against personal attack and injury in Taiwan? Those who fought at parliament should be jailed for their crimes. Isn’t this the job of a DA? How come I didn’t see any guards in the parliament? First time offender should be barred from attending parliament meeting for a month. Repeated offenders should be put in jail according to the seriousness of the offense. Shame on those who were involved in the fights. What’s most puzzling to me is that guys and gals (yes, they were equally bad) like this still got elected by their constituents time after time. What kind of democracy is this?Lawless in the highest legislature body sure set a good example to students from elementary schools to Universities. Many of these legislators use their position and power to benefit their own pockets. A good example is the former president who is wiating for his day in court. Mr. President, isn’t it time to do something about this? Posted by hslu in Food, Restaurants. Do you know that Uno Chicago Pizzeria has filed for Chapter 11 bankruptcy protection today? The company closed 16 under-performing restaurants which left them with 179 restaurants in the U. S.
Up to 9/30/2009, the company had $286.9 million in sales which translates into an average monthly sales of $1.47 million per store, or about $120,000 per store per month. That’s not a lot considering their size and operation. The company will continue to operate but two private companies will hold a majority stake of the company once it emerges out of bankruptcy in Sprig, 2010. 喜相逢 on Gallows has closed. The site has been converted into a Pollo restaurant. It has roasted chicken and deep-fried plantains. I didn’t like the smell of the spacious restaurant and we didn’t try their food. A Vietnamese restaurant in the same shopping center has been converted into a Chinese restaurant a while back. Business has been lousy though. It then changed into a buffet place which helped its business. Not sure about their profitability though. A new Cantonese restaurant in the new Lotte Shopping Center in Chantilly has opened for 5 months now. Their business has been slow. They do open until after 12 midnight though when we visited them a while back. The Tysons One Shopping Center opened a sushi place called Wasabi Sushi. 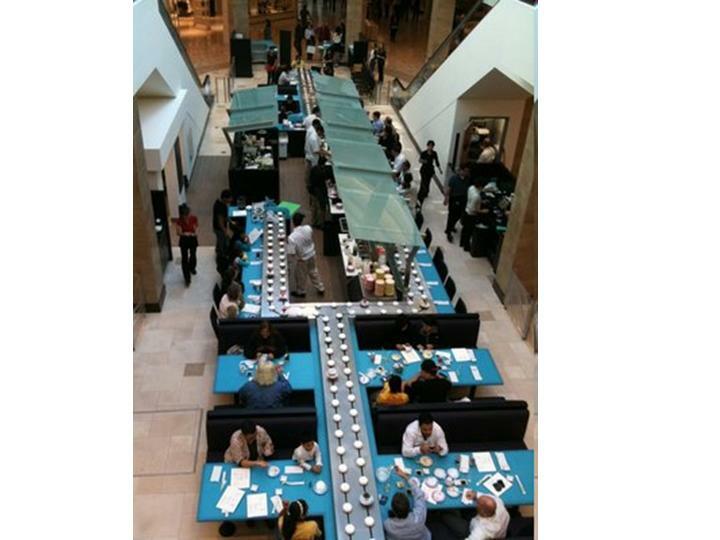 It converted an area between two escalators into a restaurant featuring moving sushi bar. Sushi dishes are color-coded and the prices range from $3 to $6.Haven’t tried it yet. My first impression was that it has very little kitchen space. May be it doesn’t need that much storage space and work area for sushi.The concept was good though but have they thought about what happens if the conveyor belt stops working during rush hour. I am not going to try it just yet. For one thing, I don’t want to try anything that just sits there going around and around. If it doesn’t sell now, they’ll just took it down, put it in the under counter fridge and bring it back out after 2 hours. None will know. They do have good businesses though and the guy who dressed like a boss was very busy taking care of credit card machine. Hmm, with hundreds of people up and down on the escalators watching you eat is an experience I can do without. I am not sure what else they have other than sushi and miso soups. If you make $50,000 a year but spend $80,000 year in and year out, should you be concerned? Not to mention that you already owed $260,000 from previous spending sprees! Well, you did say that the interest rates on your loans are very low though. It will remain low for the next year or so. That’s what the U.S. government is doing now.